Fans of Punch cigars are going to have a new version next month—the Punch Gran Puro Nicaragua. The cigars are made in Honduras at the STG Danlí factory (a.k.a. HATSA), and are loaded with Nicaraguan tobacco. Although the word "puro" is in the name, Punch Gran Puro Nicaragua cigars are not puros by definition. While the high-priming binder and filler tobacco is from Nicaragua, the cigars are enveloped in a Connecticut broadleaf wrapper. It comes in four sizes—4 7/8 by 48, 5 1/2 by 54, 6 by 54 and 7 1/2 by 54—and is slated to retail from $5.29 to $6.99 before taxes. 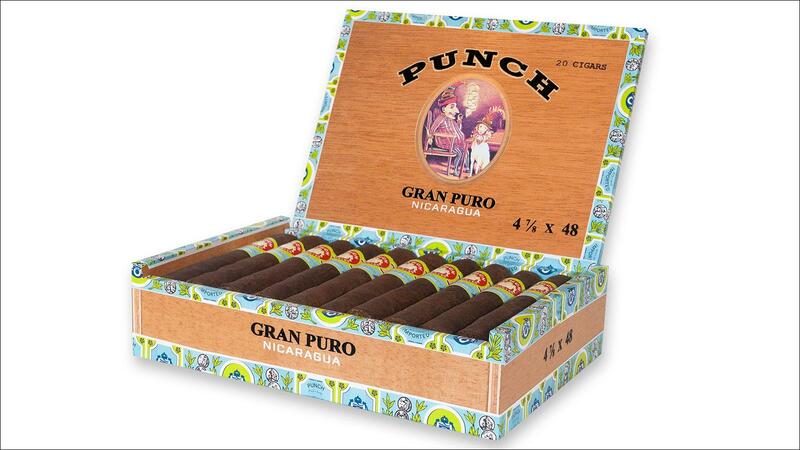 The Punch Gran Puro Nicaragua packaging is similar to the original Punch Gran Puro with minor changes to the box's color scheme. And while the band's design pattern is essentially the same, the colors have changed from black and gold to blue and green. The same heraldic Punch coat-of-arms remains as its central motif. Like many of General Cigar's heritage lines, Punch is a non-Cuban version of a venerable Cuban cigar brand. After Fidel Castro took control of Cuba and nationalized the cigar industry, Punch brand-owner Fernando Palacios fled Cuba and sold the Punch trademark to Villazon & Co., which produced a U.S.-friendly, parallel version of Punch without Cuban tobacco. In 1997, General Cigar acquired Villazon and all its brands. See an upcoming issue of Cigar Insider for a vertical brand tasting of the Punch Gran Puro Nicaragua. This article first appeared in the January 10 edition of Cigar Insider.